Akshay Kumar's latest patriotic film, Kesari, has opened in theatres. The movie's release made the actor to post a very amusing picture on his social media. In the picture, we can see Akshay hiding in the bushes, probably because of anxiety regarding a new film release. But what he did not know was that he was providing fodder to the internet for a whole new bunch of memes and jokes. Twitterati took upon the holy task to think of as many jokes on the said picture as possible. From calling the pic a reminder of a Simpsons joke to the potential for another patriotic script, the internet explored various avenues of humour. Kesari Box Office Collection Day 1: Akshay Kumar Starrer Becomes the Biggest Opener of 2019, Beats Ranveer Singh's Gully Boy by Raking in Rs 21.50 Crore. That is the beauty of the internet. You can put out the purest and the most sacred thoughts out there on any digital platform, and the internet will find a way to ruin it with jokes. 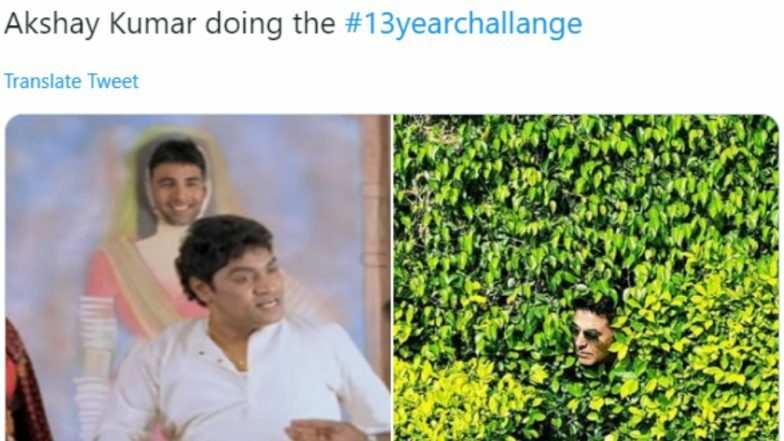 Here are the jokes that made Twitter a better place at the expense of Akshay Kumar. Kesari Movie Review: Akshay Kumar’s Tribute to Battle of Saragarhi Is a Wasted Opportunity That Works Only in Parts. Kesari has been directed by Anurag Singh. The movie has been backed by Karan Johar's Dharma Productions. The war drama also stars Parineeti Chopra in a small but impactful role. The retells a tale from the pages of Indian history. It is a fictional account of the Battle of Saragarhi, which saw 21 Sikh soldiers of the British regiment fight against 10,000 Afghan invaders.